Review: "GoAnywhere MFT Makes Your Automated File Transfers Effortless"
We are currently using GoAnywhere MFT across our entire organization. We use it for the automated movement of files across multiple platforms -- Windows, iSeries, Linux, etc. We also use it for sending and receiving files to our external business partners. GoAnywhere provides functionality such as file copies, FTP, e-mail capabilities, file compression, and file encryption. GoAnywhere MFT makes the encryption and decryption of files effortless. GoAnywhere MFT provides great automation capabilities, including automated scheduling and triggers. GoAnywhere MFT is able to translate data into many different formats, including text files, Excel, XML, .csv, etc. I can't think of any functionality that we need, but that is missing in GoAnywhere MFT. GoAnywhere MFT is especially well-suited for automated file movement across platforms, as well as with external business partners. Review: "GoAnywhere MFT is a tremendous product for our file transfer needs!" 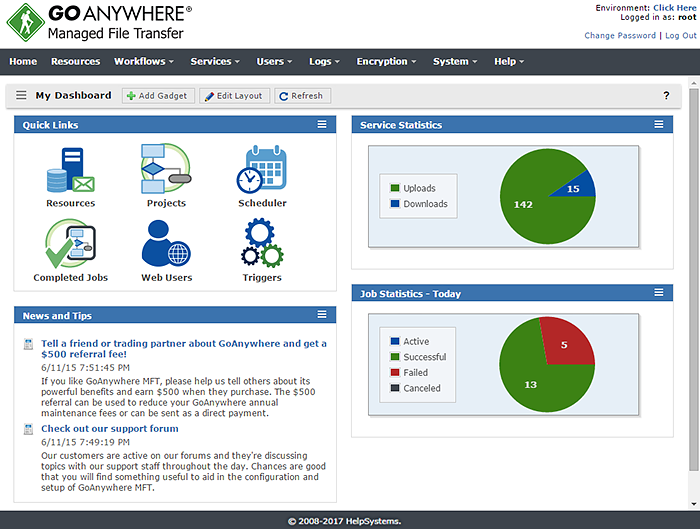 We utilize GoAnywhere MFT for secure file transfers to and from our vendors. We also use it internally for data transfers between internal systems and automated e-mail tasks. The platform is used across our entire organization. Before purchasing GA MFT, we were combining powershell scripts, Windows Task Scheduler and IpSwitch WSFTP to automate file transfers and other tasks. That was an administrative nightmare! Automated Task Scheduling - This is a no-brainer. Schedules are easily set up to accomplish anything from basic file transfer tasks to advanced database queries and e-mails. User Interface - Easy to navigate and organized. A central administration dashboard is available to keep up with processes and users. Multiple file transfer solutions - GA MFT provides FTP, FTPS, SFTP, HTTPS, Secure E-Mail as options for secure file transfers. If one method does not suit the needs internally or for a vendor, other options are available. Not really a con, but would like to see more robust examples of different tasks. Other than that, this product is top notch. GA MFT is excellent for secure transfers to/from our vendors. We can either connect out to their FTP platform or they can connect to us. File transfers are secure and with the ability to send out Success or Failure notifications internally and/or to the client. Specifically, we can query an in-house SQL database, create a file (txt, xls, etc.) to send the results to our vendor. GoAnywhere MFT Review: "The only MFT solution that you will ever need." We use GoAnywhere MFT across multiple departments across our organization. GoAnywhere enables users to log in securely and access their projects for on-demand execution, reducing the burden on the end user to submit a help desk ticket and the time that IT staff would take to assist with the request. Any process that involves downloading or uploading files to outside vendors or the general moving and archiving of files on our internal network is accomplished using GoAnywhere MFT. Enables users to log in securely and access their projects for on-demand execution. It just works, create your project, schedule it, and relax knowing that files will be there when your vendor expects them to be. Extremely robust feature set, can do complex data translations and transfers. Excellent support, I haven’t ever had an issue that support could not address. If your organization was similar to ours where you are using CuteFTP, WINSCP, Bat Files, VBScripts, Perl Scripts, Access Database Macros, and Windows scheduled tasks to move files around then you need to get GoAnywhere. GoAnywhere has a robust feature set that can automate the most complex workflows easily. For example you can extract data from a SQL database, export the data to an Excel spreadsheet, save the file with a new file name; adding a time stamp to the end. PGP encrypt the Excel file; [add] SFTP to an outside vendor all in a single executable task. GoAnywhere MFT is a secure file transfer solution that automates and encrypts data using industry standard protocols (e.g. OpenPGP, SFTP, HTTPS). With auditing and reporting, GoAnywhere can help organizations meet compliance regulations like PCI DSS and HIPAA. GoAnywhere can be deployed on-premises or in the cloud. As a VMware validated product, it also runs in several virtualized environments including VMware, Amazon AWS, and Microsoft Azure. GoAnywhere exchanges batch and ad-hoc file transfers, executes tasks before and/or after transfers, and gives users and partners a secure way to exchange data.